We all love the holidays. Whether it's gathering with family, home-cooked meals, or taking a little breather from work or school, the holidays give us permission to take it easy. However, taking a break from working out can mean that all those extra holiday calories start to add up. No one wants to go back to work or school with an extra spare tire or a pound or two on the scales. Want to avoid the holiday glut? Here are 15 workout tips that you should consider adding to your regular routine, especially after the holidays. Let's face it, the holidays can be stressful. We're planning events with in-laws, sorting through party invitations, dealing with shopping chaos, hysterical children, etc. Yoga not only calms the mind, but it tightens the body. Practicing yoga will de-clutter those cluttering thoughts that have been lurking during your holiday break. Leave the chattering monkey behind and de-stress your way to a better body. Better yet, yoga is easily practiced indoors or even in the comfort and convenience of your own home. No excuses! Sounds a little strange but PiYo has become one of the most popular forms of fitness. In case you haven't heard, PiYo is the lovechild of yoga and Pilates. By combining the strength and conditioning regimens of Pilates with the mindfulness techniques of yoga, the holiday stress will soon seem like a distant memory. Better yet, keep the routine for a lifetime of stress reduction, the holidays come and go, but stress stays put. Most of our country feels the brunt of winter during the holiday season, so instead of fighting our urges to stay inside and eating junky food, try embracing the winter weather! After the last of the leftovers has been eaten, get outside and inhale that cold, clean air, feet donned with snowshoes, skis or skates. 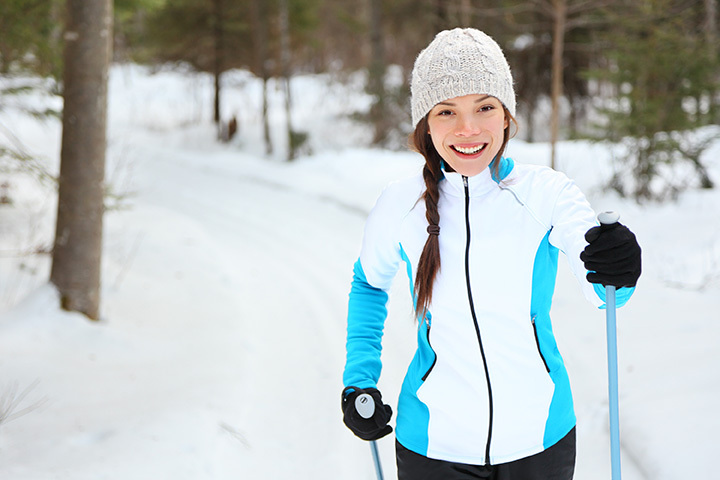 Did you know cross-country skiing burns 1,122 calories an hour? Find your groove with a variety of outdoor and calorie-consuming exercise. Who knows, maybe next year's holidays will be spent in Vale, slaloming down the vigorous trails. It is a fact that most gym owners will see that surge of new membership in early January, only to see the rates plummet by the end of February. Why? Commitment is difficult. Sure, working out sounds great and fits in neatly to those still-fresh New Year's resolutions, however, the reality is that cardio can quickly become unpleasant and easily dismissed. Experts say a habit takes 21 days to develop, so get those gym shoes tied, workout bag in hand and make the 21 days turn into not just a lifetime commitment, but an overall healthy lifestyle. Let's face it, sometimes it's just too hard to fit in a couple hours of gym time. What with the kids back to their sports practices, work and late meetings, not to mention dinner and other daily occurrences? So what is a person to do? How about quick and effective five-minute workouts? Jumping rope, pushups, sit-ups and stretches can quickly add up to great results, even five minutes at a time. Everyone has five minutes-so make yours count. Malls are not just for teenagers to hang out. They're actually great places to stretch those lethargic legs, especially to get rid of the winter drudgery. As a matter of fact, no longer put off those return gift items you were dreading to deal with. Return them, and then reward yourself with a 60-minute brisk walk around the perimeter of the mall. Not only will you get your chores out of the way, you'll be getting great exercise to boot. If you work in an expansive business complex, make sure to use stairs at every opportunity. Not only will you be able to get a little exercise in, but that pumping blood will help boost some of your hardworking brain power as well. Wherever possible, use the staircases, whether at home, school, or work. Your body will thank you for your efforts. On the theme of finding a workout wherever you can, try to park as far away as possible. The extra distance will add up each and every time you get out of the car. Yes, it can be an inconvenience to have to walk an extra amount with a grocery cart full of produce, and yes, the kids might complain about the snow and slush they have to wade through, but fitting in a little physical exercise does more than help tone and trim, it gives your winter-weary brain a boost as well. Consider this: exercise will help alleviate stress and depression, something that can easily happen after a few too many indulgences and not enough physical exercise. The house is still a mess and the holidays were two weeks ago. The Christmas tree has more needles on the carpet than it does upon its very dehydrated branches, even the angel on top looks a little fatigued and forlorn. It's time to grab those holiday boxes and use up the weekend for an uber-cleaning workout. You can burn up to 200 calories an hour with vigorous housekeeping and those nasty pine needles will soon be a thing of the distant past. Cleaning will help decrease that winter funk as well, putting a little spring in your step, some tightening and toning, just in time for the next holiday: Valentine's Day! The good news about swimming is that it is indoors, something that works well while navigating a three-foot blizzard or steady rain for the past two weeks. Let's face it, if you're going to be wet and miserable, you might as well get some physical efforts in as well. Swimming is great aerobic and cardiovascular exercise. Find a local gym with an indoor pool, hours are generally open very early or very late, so should work with your demanding schedule. Sometimes holidays mean travel. And traveling can disrupt your everyday routine, including going to the gym. Not to fret. You can still manage to visit friends/family but maintain your regular fitness regimen. Call or go online to see if there is a gym in the out-of-town area that will honor your local gym membership. Many times gyms will have a reciprocity arrangement so you have no more excuses. Find that local gym and still be back in time for your great Aunt Edith's famous pot roast. Yes, that first winter snowfall can be beautiful. From your cozy living room window you can gaze upon those lovely drifts, the clear, crisp night sky and of course, foot upon foot of the white stuff. However, instead of dreading dealing with it, commit to removing it. Shoveling snow is a definite all body workout. Just be careful to not over do it. Anytime you are having trouble breathing or feeling sharp pain, take a break. The snow's not going anywhere and chances are you'll have another couple of inches to contend it by the time you reach the end of your driveway. Think of how good it will feel by the fire, the heat soothing those pleasantly sore muscles. If you can get away with it, try to do your running around town without the car. In many snow-ridden Scandinavian countries, they do away with cars altogether, opting to take a bus, walk or sled through town. Cars in the winter can also be very dangerous and hard to maneuver. If you are close enough to walk to do your grocery shopping or heading out to grab a cup of coffee, consider putting on those snow boots, parka and warm beanie. You'll feel sorry for those traffic-locked people stuck in their half-frozen cars while you skip by, warm cup of hot chocolate in hand. Look the sun's even coming out! Not that those miserable passengers would notice through their foggy windows. Nothing like a winter sun on a chilly day! Yes, the winter might not seem ideal for spring cleanup, but there is actually a lot of important maintenance that can be done during those long, winter months. Diligently cleaning up your yard will not only help your physical appearance but will hasten a healthier yard come springtime. Consult your local home and garden store about trimming back branches. A lot of times trimming away dead branches in the winter will help boost healthier growth when the warmer months start approaching. Try to clear out those leftover leaves from November if you never had a chance to and throw them in your new composting bin. It will become fertile, rich and full of nutrients, just in time for spring planting. The winter can be hard. Reduced daylight hours and inclement weather might not be conducive to outdoor activities. What to do to help brighten your lackluster mood and get in a little physical release? How about seeking out a new hobby? Try looking into a local bowling league. You might not be burning off all of that extra eggnog, but at least you're not sitting at home, bowl of chips and remote in hand, either. Maybe you've always wanted to learn how to dance, but worried about your two left feet. How about country-western dancing or ballroom dancing? There are plenty of fun-filled activities that are perfect for those long winter evenings.